What I really wanted out of this book was Harley taking part in a vicious roller derby, smashing her opponents left and right with a hammer. That doesn’t quite happen, but something similar does. The start to the issue is pretty interesting. Following the Joker’s latest explosive tantrum, and finding out that some previous patient of hers has left her a property in Coney Island, New York, Harley picks up the pieces of her life, stuffs them all up in one giant oversized bag that could give Jabba the Hutt a run for his credits in terms of girth, and heads off to the Big Apple. On the way, she rescues a poor dachshund from an inconsiderate owner, kills an assassin, and once she arrives, she applies for jobs to pay for all the rent on her new building, among other things. Oh and she has to pay taxes. Lot to take in right? Story-wise, I really liked this issue. Jimmy and Amanda are giving Harley a new start for this series and they are essentially cutting her off from all the intensely violent elements of her past. There’s no mention of the Suicide Squad in this book, nor do we see the Joker in any shape or form. This entire issue is about Harley, with Harley, all throughout and it is one hell of a ride to be sure. Jimmy and Amanda are pretty damn good writers and they certainly write the character as someone who is free to do what she wants, however she wants to do it. To pay for the rent on her new place, she applies at a local mental hospital and also takes a job at the local roller derby place, two of the most incongruous things ever. But the writers make it all work. Harley in the New 52 has been a rather disappointing character, certainly nothing at all like her various animated appearances, especially not Batman: The Animated Series, which was her debut platform. With this issue however, it seems that the writers are attempting to fuse that version and the New 52 version of her character together. She’s not as goofy as the animated series, but neither is she as completely violent as she’s been in Suicide Squad. The writers bring her to a middle point and then go from there. Thing is, despite all the good stuff, the first issue seems too much like a setup. It is somewhat expected since this begins a completely fresh start for her, but still, the pace was a little flat because of that, despite all the crazy going on throughout. And one thing that bothered me is that she is able to take a job under her actual name, Harleen Quinzel, without setting off any red flags at her new employer’s, and neither is there any police activity since she rides her bike in her full costume throughout New York. That should have set off a few alarm bells, but we don’t see any of it. Yet. The pencilwork in this issue is by Chad Hardin, and the colours are by Alex Sinclair. Chad Hardin wouldn’t have been my pick for this title, especially not with the way that Jimmy and Amanda write it. I would have preferred to see Dan Panosian, Stephane Roux, Amanda herself, or Dave Johnson on the title. I loved their interpretations far more in the zero issue. Chad’s characterwork tends towards the more… muscled look and it just isn’t to my taste. But, all the same, he draws the side characters really well, and he gives some great backgrounds in the issue. Alex Sinclair’s colours help fill up most of the deficiencies of the pencils though, and Harley does end up being a fairly gorgeous book. If Chad can improve on things a little, this is going to be a really fun book. Overall, not as plain awesome as the zeor issue, but still fairly decent, all things told. 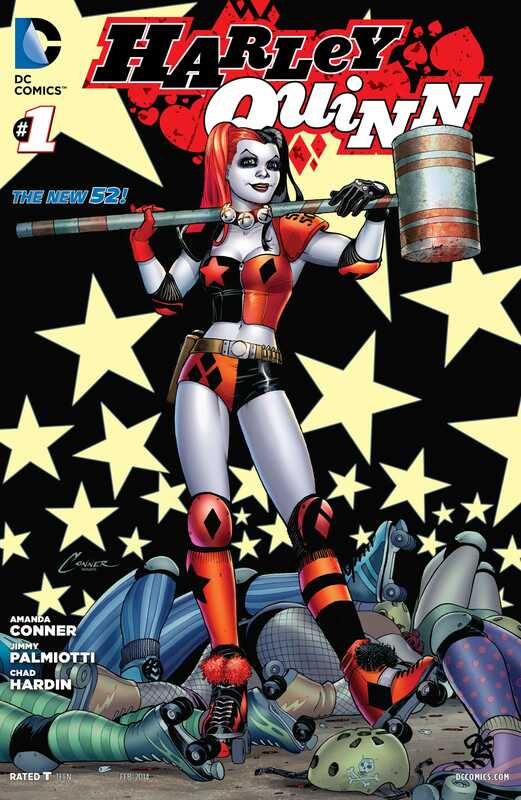 Posted on December 19, 2013, in Comics Reviews, Review Central and tagged Alex Sinclair, Amanda Conner, Batman, Chad Hardin, Comics, Comics Review, DC Comics, Funny, Harleen Quinzel, Harley Quinn, Humour, Jimmy Palmiotti, Joker, New 52, Review, Review Central. Bookmark the permalink. 10 Comments. I pretty much love anything to do with the lovely Miss Q., and I enjoyed this issue – even if it was merely a set-up of things to come. I must admit though, I really like her ultra-violent incarnation in Suicide Squad as well. Nice write-up.